Every homeowner wants a nice-looking yard, but having the spare time to make it happen is easier said than done. If you find yourself short on time but still want to have an eye-catching yard, don’t worry. You don’t necessarily have to devote hours to working on your yard each week to make it look great. One great trick is to use low-maintenance plants. If you’re worried that low-maintenance plants aren’t going to be attractive, think again. There are plenty of stunning options. As long as you know your USDA Plant Hardiness Zone rating and pay attention to the requirements of the plants you choose, you should be good to go. Learn about 20 great low-maintenance plants for the yard below. The foam flower, or Tiarella cordifolia, is an excellent option if you’re in need of eye-catching ground cover. It thrives in zones three through nine, and it blooms in the late spring and early summer. Although it spreads quickly, it goes around other plants and won’t disrupt their growth. This velvety-leafed plant does especially well in wooded and shaded areas, so keep that in mind when planting it. Otherwise known as Armeria, the sea thrift is a unique type of grass that can instantly spruce up a yard. It’s suitable for areas that are in zones four through nine, and it can withstand remarkably harsh environments. Indeed, this hardy plant grows well in uninviting, rocky soil, and it can tolerate strong winds with surprising ease. Its flowers bloom in the spring and early summer, and you should deadhead it at least once per year to keep the blooms in great shape. The grey owl juniper, or Juniperus virginiana, is a slow-growing spreading conifer that has a uniquely gorgeous look. It does especially well in zones two through nine, so it is suitable just about everywhere. Make sure that you plant it in full sun or light shade. Average, moist soil that is well drained is ideal. Its striking gray-green foliage turns purple in the winter. When it’s not covered by snow, then, it offers year-round appeal to the yard. The best part of all is that little to no maintenance is required. It’s easy to see why the hosta is such a popular plant. This attractive perennial offers white and purple flowers that bloom during the middle of the summer. Even when it’s not in bloom, however, this plant has a distinctive appearance that breathes extra visual interest into any yard. There is one drawback: It’s wildly popular with slugs and deer. Thick-leafed varieties aren’t quite as appealing to slugs, though, and deer deterrent is always an option. Most varieties need partial shade, but gold-leafed varieties thrive with more sunshine. The first thing to know about variegated ribbon grass, which is also known as Pharlaris arundinacea, is that it’s banned in places where it isn’t a native species. It’s native to Canada and many northern U.S. states, but you should check to make sure before planting it because it can be invasive. This plant does especially well in zones four through nine, and its white, spiky flowers bloom in the summer. For best results, plant in wet soil that gets plenty of direct sunlight. It does fine in partial shade too. If you live in zones three through nine and are looking for a drought-resistant plant, the blazing star may be right for you. This plant, which is also known as Liatris spicata, typically blooms from mid-summer through the fall. It flowers are usually white or purple. Because it’s native to marshy areas but resistant to drought, it does well under a wide variety of conditions. You’ll love the texture that it adds to your yard. This uniquely named plant is also known as Dianthus gratianopolitanus, and it tends to do especially well in zones four through eight. With its silver foliage and pink, carnation-like flowers, this plant has a delightfully distinctive appearance that’s sure to spice up your landscaping. As a mounding evergreen perennial, it works well as ground cover. This plant prefers soil that is well drained and moist, and it should be planted in a part of the yard that gets a lot of sunshine. With a minimal amount of care, this plant will serve you well. There are many popular perennials out there, but the coneflower, which is also known as Echinacea purpurea, deserves a mention on this list. It is suitable for homes that are in zones two through 10, so you can almost certainly plant it where you live without worry. Purple used to be the only option. Today, however, colors like pink, white, orange, yellow and red are readily available. This hardy plant blooms all summer long. To make that happen, though, you need to deadhead whenever dead flowers appear. This stunning deciduous shrub, which is also known as Cotinus coggygria, is just the thing if you need a nice focal point for your yard. In addition to standing out beautifully, this shrub is easy to manage. It is suitable for zones five through eight, and it works well with average soil. Just make sure that the soil contains a decent amount of organic matter and is well drained. Puffy, pink flowers bloom during the summer, and the deep purple leaves bring flair to the table as well. People who live in zones three through eight and would like to add splashes of colors to their yard should consider coral bells, which is also known as Heuchera. As long as it’s planted in partial shade, this plant should serve you well for a long time to come. Its blooms, which can be pink, white or red, come in the late spring or early summer. This plant also has colorful leaves, so it adds character to a yard throughout the year. Winter king hawthorn, or Crataegus vindis, is a small deciduous tree that packs a real wallop in terms of flair. Flat clusters of white flowers bloom on the tree, which thrives in zones five through seven, in the springtime. To do its very best, this tree needs decent air circulation, so don’t relegate it to a stuffy corner of your yard. It also needs full sunshine, and it should be planted in well-drained soil to keep looking its best. If you opt for the double-blossomed variety of this exquisite plant, which thrives in zones two through nine, you should be prepared to stake it. Otherwise, it will slump over and could even die. 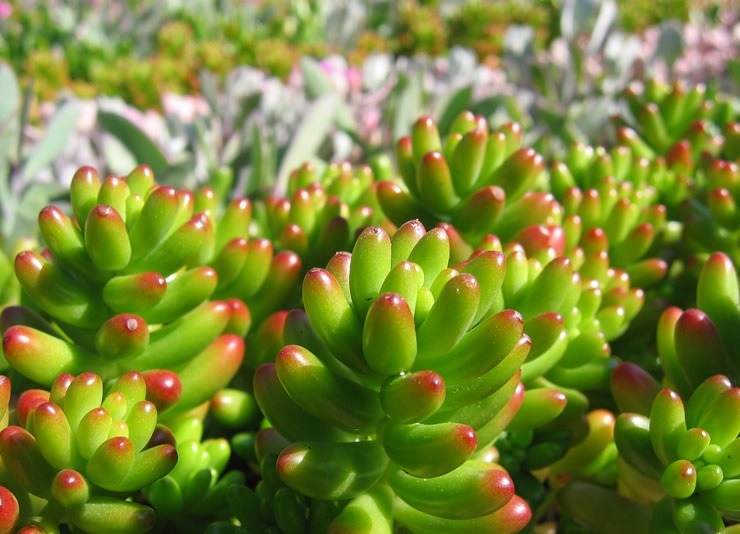 In addition to boasting bright, red, pink, yellow and red flowers, this plant has bushy foliage that adds a lot of character to the yard. Even if it appears that these plants are becoming crowded, they shouldn’t be divided. They don’t tolerate it well, and they could all suffer because of it. The variegated coloring of this eye-catching ground cover is sure to spruce up your yard in an exciting way. Avalanche feather reed grass, which is otherwise known as Calamagrostis x acutiflora, is suitable for homes that are in zones five through nine. Its foliage features variegated patterns of white and green that work well with many landscaping design schemes. In the summertime, this plant boasts pink flowers that breathe excitement into any yard. Plant in an area that gets plenty of sunlight and in well-drained soil. This ornamental grass, which is also known as Festuca cinerea, has blue-gray foliage that looks especially nice when paired with brightly colored flowers. It has flowers of its own too, and they are blue-green in color. As long as you’re located in zones four through seven, you can plant Elijah blue fescue with confidence. Just make sure to plant it in well-drained soil that is moist or dry. Keep in mind that it grows eight to 12 inches tall as well. With its grass-like foliage and bright colors, bowles garden sedge, or Carex elata, is a cheerful choice for a yard. Of course, it helps if you live in zones five through eight, which is where this plant tends to thrive. It’s an evergreen clumping perennial, and its foliage has green and yellow variegated patterns. As far as maintenance, it needs to be pruned down to three or four inches in height from time to time, and it should be divided every two to four years. Plant it in moist or damp soil in full sun or full shade. This irregular, deciduous tree is a unique choice for yards that are located in zones three through nine. Its gold-colored leaves have a fern-like quality that breathes a touch of exotic flair. When its white flowers bloom, it looks especially striking. One of the best things about this plant is that it tolerates a wide variety of different soil types. However, it does need to be planted where it can be out in the sun, and the soil should be well drained. The adaptable nature of this surprisingly hardy plant makes it a popular choice. You’re well-advised to plant Siberian isis, which is also known as Iris siberica, if you live in zones three through nine. With blue, white or purple blooms, this plant couldn’t be more stunning. They appear in the late spring, but this plant looks terrific all year long. If it becomes too crowded, divide it. Make sure to plant it in moist soil, and keep in mind that it spreads quickly. You can feel free to plant the globe thistle, or Echinops ritro, without worry; it’s not weedy or invasive. From the early summer to the early fall, it comes to life with blue or white blooms that liven up the yard in a big way. What’s even better is that its seed head looks good too, so it enhances the yard throughout the year. The globe thistle does well in zones three through nine, and you don’t have to worry about deadheading it. It can even be planted in dry, low-quality soil. This stunning plant takes on many different looks throughout the year. It begins with purple leaves, blooms with bright yellow flowers in the middle of the year and grows red fruit late in the year. There’s one caveat: It’s considered an invasive plant in the Mid-Atlantic, Midwest and Southeast, so check locally before planting it. This plant grows well in full sun and in light shade, and it needs soil that is moist and well drained. One big perk is that it is resistant to drought. Otherwise known as Perovskia atriplicifolia, this eye-catching plant is well-suited for zones three through nine. From the middle of the summer through the fall, it has blue flowers that set it apart in a bold way. When periodically pruned, it produces a haze of blue that forms a lovely backdrop in any yard. For best results, prune it down to eight to 10 inches in the spring. This plant requires good drainage and full sunlight. One big perk is that it’s not popular with any kind of pest. By browsing through this list and zeroing in on plants that thrive where you live, you should be able to brighten up your yard without a whole lot of effort. After they’ve been planted, these plants tend to do quite well with a minimal amount of maintenance, which will allow you to focus on other things. Always double check to make sure that a plant is suitable for your region and for your yard. If you don’t have a sunny patch for a plant that needs a lot of sunlight, for example, try something else. Your yard will be filled with lovely plants before you know it.